Backhousia myrtifolia is known both as the Grey Myrtle and Cinnamon Myrtle. A rainforest tree from Southern Queensland. 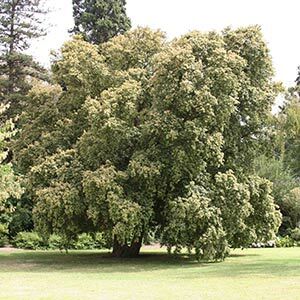 to New South Wales this is a tree that grows well as far south as Melbourne where it is used in parks and gardens. Small tree to 7m, smaller in cultivation with slightly weeping branches. Large clusters of creamy white flowers in spring to summer. The aromatic foliage when rubbed will give off a cinnamon fragrance. Leaves are uses in cooking especially savoury dishes. Although this is a tree that flowers profusely, seed is difficult to obtain. Backhousia myrtifolia can be successfully grown from cuttings and this is a favoured method of propagation. It is also a species that takes a little care when establishing. Young plants take time to establish a good root system and will not withstand long dry periods over the first few summers. Country of origin – Australia New south Wales to Queensland. Height – 7 – 8m often smaller in cultivation. 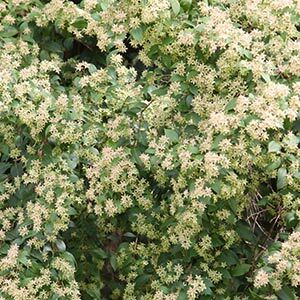 Backhousia myrtifolia will form a very dense canopy and although it is not a large tree, use in smaller home gardens is limited. In larger garden it makes a very attractive feature tree and can make an excellent screen. Useful as a street tree, also used as a screening plant and to attract native birds to the garden. Grows well in light shade. Can be tip pruned from a young age to maintain a more bushy habit.